Stanford University School of Medicine has developed a relatively simple new imaging technique that provides a very exact way to capture the synapses of a connectome with pinpoint 3D positional accuracy, and considerable contextual resolution. Stanford has performed a study (see below), which was admittedly done primarily just to showcase the new technique. That said, the study managed to produce a very impressive new find. It sounds too good to be true, doesn't it? This level of detailed visualization has never been achieved before, Smith said. “The entire anatomical context of the synapses is preserved. You know right where each one is, and what kind it is,” he said. It also allows the neurons to be viewed in registration, though only to a limited extent. 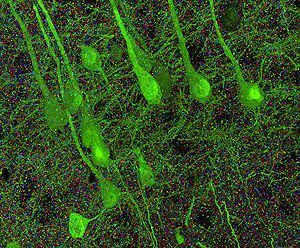 The Stanford team used brain samples from a mouse that had been bioengineered so that particularly large neurons that abound in the cerebral cortex express a fluorescent protein, normally found in jellyfish, that glows yellowish-green. This let them visualize synapses against the background of the neurons they linked. What it doesn't do is associate each synapse with its source neuron. That is, it doesn't show a link back to the pre-synaptic neuron from which the axon making the synaptic connection originated. That said, the ability to see the synapse's type is likely to play an important role in this activity as we learn more about correlations between synapse types and their source locations. The researchers were able to “travel” through the resulting 3-D mosaic and observe different colors corresponding to different synaptic types just as a voyager might transit outer space and note the different hues of the stars dotting the infinite blackness. A movie was also created by this software. Array tomography, an imaging method co-invented by Smith and Kristina Micheva, PhD, who is a senior staff scientist in Smith’s lab, was used in this study as follows: A slab of tissue — in this case, from a mouse’s cerebral cortex — was carefully sliced into sections only 70 nanometers thick. (That’s the distance spanned by 700 hydrogen atoms theoretically lined up side by side.) These ultrathin sections were stained with antibodies designed to match 17 different synapse-associated proteins, and they were further modified by conjugation to molecules that respond to light by glowing in different colors. The antibodies were applied in groups of three to the brain sections. After each application huge numbers of extremely high-resolution photographs were automatically generated to record the locations of different fluorescing colors associated with antibodies to different synaptic proteins. The antibodies were then chemically rinsed away and the procedure was repeated with the next set of three antibodies, and so forth. Each individual synapse thus acquired its own protein-composition “signature,” enabling the compilation of a very fine-grained catalog of the brain’s varied synaptic types. All the information captured in the photos was recorded and processed by novel computational software, most of it designed by study co-author Brad Busse, a graduate student in Smith's lab. It virtually stitched together all the slices in the original slab into a three-dimensional image that can be rotated, penetrated and navigated by the researchers. I wonder if this technique could be combined with Stanford's to allow visualization of the entire connectome. A trip through a slice of mouse brain.